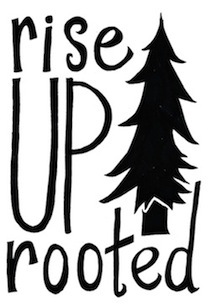 Rise Up Rooted documents our pursuit to live the life our idealistic, 15-year-old-selves imagined we would. A life that makes our bellies tingle. Share in our adventures (and misadventures) in cultivating a world of big and small, joyful moments. Follow along as we tackle renovation projects, seek simplicity, and run head-on into the big unknowns of the universe we are all a part of. Katie and Jamie's friendship started in the 1980s in Bethel, Alaska. Their sisterhood evolved from wild teenage years along the mighty Kuskokwim River, to college shenanigans beside the Clark Fork, and through the many uncharted waters in between. Katie currently resides in a shiny Silver Streak travel trailer on the most beautiful hill in all of Oregon. Jamie lives in a tiny, cozy home beneath Montana's big sky and between rivers and mountains with the loves of her life.